Two of my three good moments are about my grandmothers (paternal and maternal). I love them both, and I don’t know what I would do without them. Its like 2am here, Priya and I are sitting here having girl talk as I upload pics to my bhai’s external drive. 1. Woke up and showered, then laid down next to my Nani (maternal G-ma) and talked to her, it was cute and fun, pillow talk with the nani. OH and a sidenote good moment: figured out how to fix my comp!!!!!! I got to spend some quality time with the fambam in baroda, it was actually really nice. No sleeping until 7pm. I really miss my nani (mom’s mom). She is so adorable and sweet, I also just love visiting my Mama and Mami, they spoil my ridiculously and feed like crazy. It’s a home filled with love and my cousins are my sisters, we talk and talk as if we were never apart. It has always been our relationship, and I love it. 1. Wake up call from my brother, waking up his 3 sisters, thanks Rishi for the wake up call! 8am is not early enough. Jabro! 2. 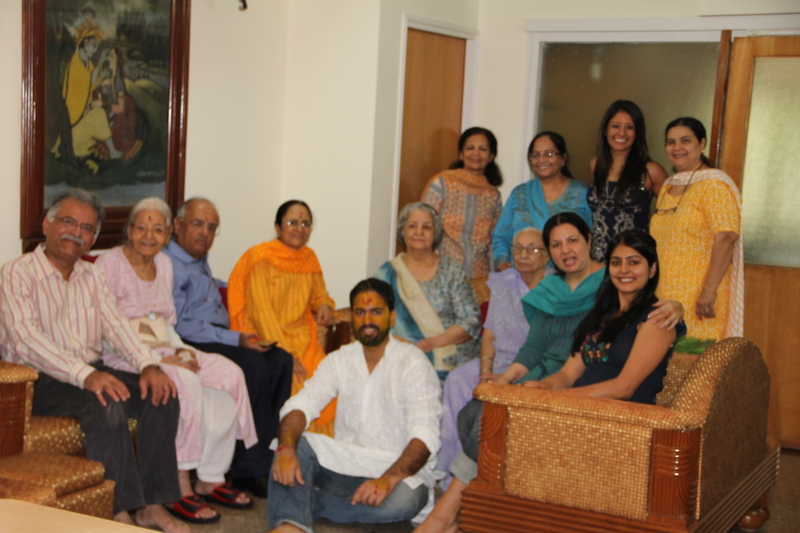 Hanging out with my family – all of them, and watching Kichadi! Hilarious movie! 3. Garba time with the brothers and sisters, not that I got in, I had to sneak in and didn’t do too much, was exhausted! Okay, time to hang with the fambam! This will be a quick update. 1. Watching my cousin get married, oh man, he’s a married man! 2. A new addition to the family, Neha Bhabhi! Welcome to the family! Okay more updates to come, gonna take a TON of pics of Baroda and maybe go see Kichadi, if my sleepy sister, Khushboo ever wakes up. 3. I got a modeling gig in India, bwahaha, the designer who designs our clothes in India has asked me to model some clothes for his new boutique. Pictures will come. 1. Went straight to the beauty parlor and got beautified – and got mendhi on my hands! Always a plus! 3. Go to see Robot – well I technically fell asleep which then made it hard for me to sleep so then my brother took me to get pastries at Grand Bhagwati, where I had a chocolate cake. 1. First wedding ceremony for me to attend, got to cover the bro in tumeric paste to make him pretty!! 3. Packing up for the wedding! It’s in Jammu! 2. FINISHING The girl with the dragon tattoo…WOW i LOVE that book! 3. Hanging out at the airport, I ate KFC – ha, Veg Zinger baby. Will update more, I am in Delhi, flight has been delayed by 1 hr 50 mins. I am laying in bed, unsure if I am sleepy or not, which is interesting, considering how sleepy I have been ALL day. My flight from Dubai to Ahemdabad, India was…interesting. A plane filled with Indian people, we have no etiquette for riding a plane. People yelling across aisles, standing up when they aren’t suppose to. It felt like a bus ride, instead of a plane ride. I am glad to be in India, the plane ride always seems painful and long, but that’s okay. I am here, with the fambam. 3. Getting a good amount of sleep. Felt SO good. I guess I should sleep now, I might read a little bit of “The Girl with the Dragon Tattoo” I am addicted. Haha, gnite folks. So I dont really know what day it is, or how many hours have passed, so I’m gonna pretend it’s the end of Saturday (from when I woke up in the USA to arriving in Dubai). The flight was long, and very uncomfortable, I don’t like trying to sleep on a plane, the cusions are not cushiony and apparently neither is my bum. Also, as an FYI, one should NOT watch a very sappy, sad movie…while on a 16 hour flight because of (a) you end up crying, red eyed, and puffy eyed, (b) the person sitting next to you think you’re weird, (c) you’re sitting next to them for 16 hours…..there is no escape. So yes, lesson learned. People watching at the airport is hilarious, people sleep funny on a chair…they look….either uncomfortable or really comfortable, spread eagle style. I can’t wait to sleep in a bed…granted an India bed is nothing compared to my Sealy, cusion top bed, but still…I can lay down! 1. Being fully packed and on the way to the airport! Getting on the flight, all bags underweight, go mom, dad, and me!!! 2. Having a pretty cool person to sit next to, thanks for being normal, girl who’s name I do not know. 3. Arriving in Dubai and not being stuck on a plane…only 4-5 more hours until I reach India! at 4am…yeayy…I either have to sleep for 4/5 hours…or stay up until 7am….options are unclear, it all depends on how I feel by the time I land. PPS. Gujus are hilarious…I will be refreshing my “typical Gujurati”. I can’t wait! Today was a very busy and hectic day and my mind is very…well it’s not working. Today was a good and busy day. So, lets’ get on with it. 1. A great meeting with SF Mission Play program. Gonna setup my kiddos with some awesome savings accounts. Okay…seriously, bed….will update when i’m in India….